Custom feed is your personal feed that is composed of articles (items) that you manually select and add from other content feeds. And these selected articles will stay in your custom feed for up to 60 days. Custom feeds is an elegant way to filter and manage selected articles. "Custom feed" option is available in Feeds Reader. 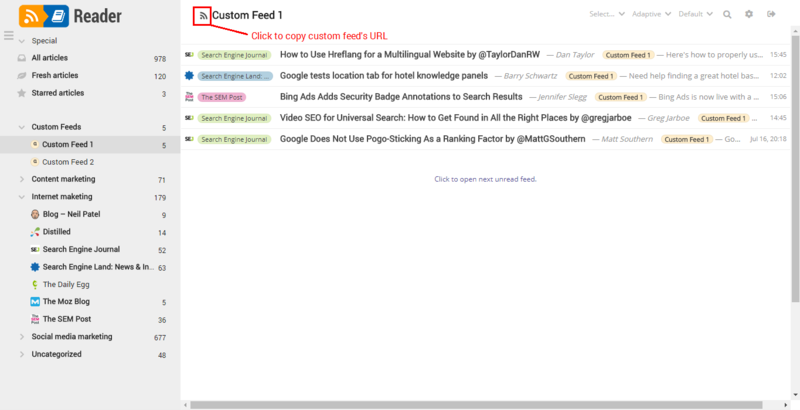 To create a custom feed you need to go to Feeds Reader to "Settings" menu and click on "Create custom feed..." option. Name your feed and press OK.
To add articles from other content feeds to one of your custom feeds, choose article you like and right-click it. Then in "Add to custom feed" option choose a feed from the list. Your custom feeds will be saved in a separate category in the left sidebar. You can use custom feeds to collect articles on a given topic or for a particular niche, featured articles from a specific content provider or with a specific content type. 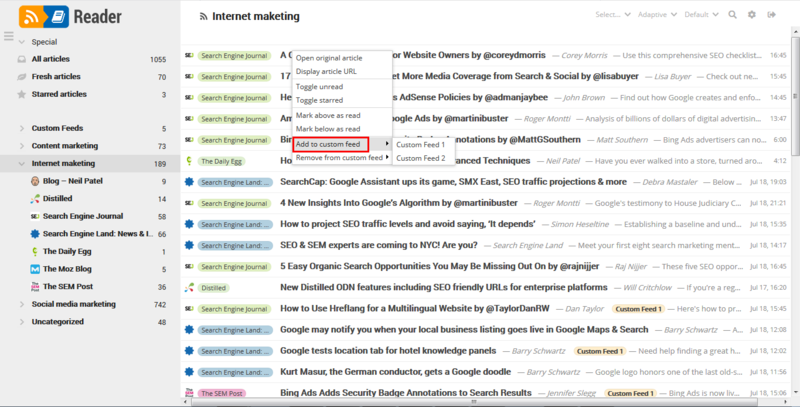 But you can also filter articles for your specific automated posting campaign or content widget. Custom feed is a way to set up a semi-automated process of updating your websites, blogs, social network accounts. "Semi" means that you will manually choose what content you would like to post. "Automated" means that your posting campaigns will continue working on complete autopilot. So first, you create a custom feed in your Feeds Reader as it was described above. You will need custom feed's URL. 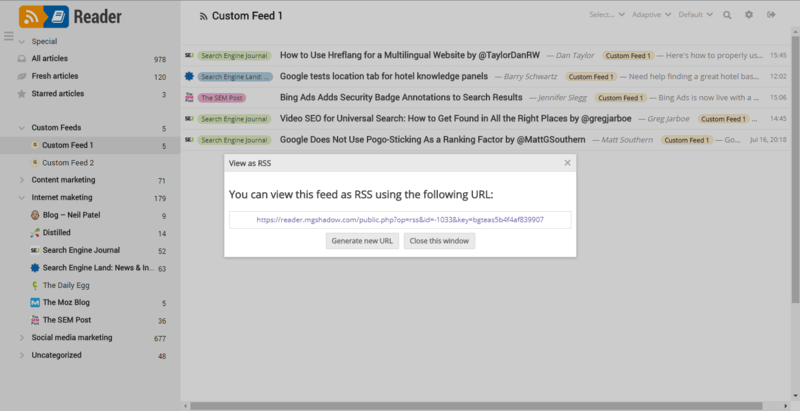 To get feed's URL, choose a custom feed from the list in the left sidebar, and then click on RSS icon next to feed's title above the list of its articles. Now you can add this URL to your automated posting campaign or content widget. You can also save this feed to your Feeds Box, so it could always be at hand. 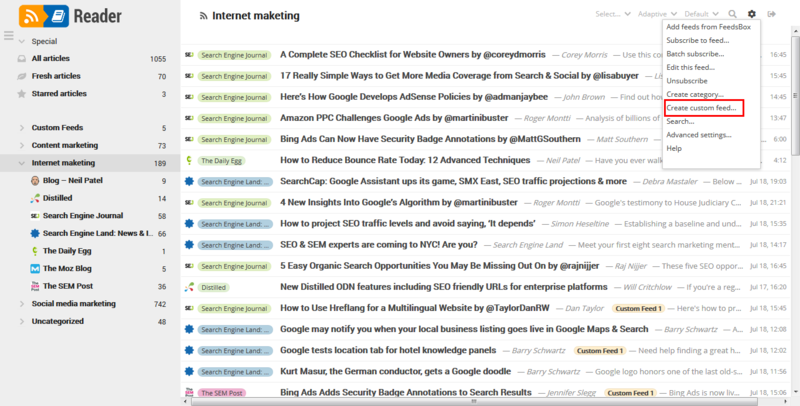 Along with custom feeds, you can use self-updating feeds of any category of your Feeds Reader or of any search result. If you still prefer a fully automated method of posting but wish your posted content to be of better quality, use "advanced content filters" option in Feeds Reader. In RSS Ground we offer you a fully automated content sharing process. You can take a bunch of content feeds and set to automatically send updates from these feeds to your blogs and social network accounts. But the number of feeds which can be added to a posting campaign is limited and content filters used in content feeds generators and posters can be not enough. Your best solution - to use custom feeds together with advanced filters. This will help you both: to use fewer feeds in posting campaigns (you can use just a single custom feed) and achieve a better content quality. The most remarkable part - the whole process will still be fully automated. Then you set up a posting campaign using custom feed. See our user guide on how to set up a posting campaign . Now advanced filters will filter content feeds in your Feeds Reader and add quality articles (items) to your custom feed. You posting campaign will use this new filtered articles and automatically post them to your blogs or social network accounts. Nice and easy!